Solidarity with Charlottesville Anti-Fascist Protesters! Honor Heather Heyer! Solidarity with Charlottesville Anti-Fascist Protesters! The racist terror bred in the bone of American capitalism struck again this weekend, in Charlottesville, Virginia. Local activist Heather Heyer was murdered and at least 35 people were treated for injuries, 19 of them hospitalized, as Ohio Nazi James Alex Fields deliberately rammed his car into a crowd. Fields went to Charlottesville to join swarms of Klan, Nazi and other fascists and white supremacists at a “Unite the Right” rally called by Charlottesville “alt-right” spokesman James Kessler and built by fascist leader Richard Spencer. The fascists said they were marching to “save” a statue of Robert E. Lee. This vile symbol of the slave-owners’ “Lost Cause” has been revered by racist scum ever since 180,000 black slaves and free blacks joined the Union army and turned the tide in the Civil War, crushing the Confederacy in the “Second American Revolution.” The statue was slated to be removed after the city council voted 3-2 in April to sell (!) it, following the outcry after white supremacist Dylann Roof gunned down nine African American churchgoers in Charleston, South Carolina two years ago. As he did last May, fascist leader Richard Spencer headed a mob of hundreds on August 11 marching with flaming torches in imitation of the German Nazis, while yelling racist, anti-immigrant and anti-Semitic slogans. 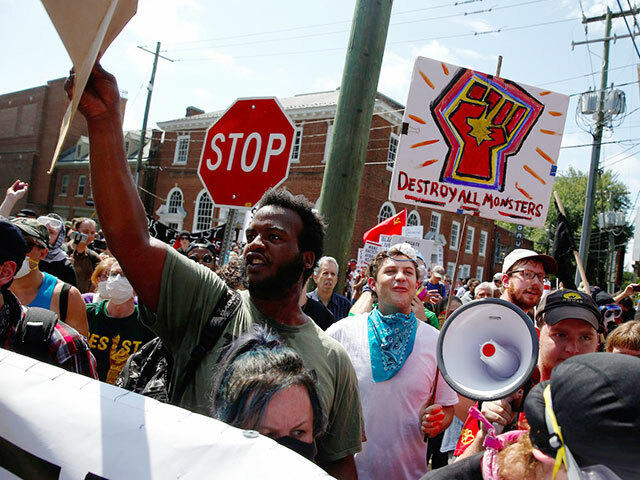 Large numbers of anti-racist protesters came out the next day to courageously stand up against the fascists and white supremacists – many of them heavily armed – while cops stood by watching the racists attack. Among those injured, according to activists’ reports, were members of Antifa groups, Black Lives Matter, Democratic Socialists of America, Industrial Workers of the World, the International Socialist Organization and others. The Internationalist Group says: Honor Heather Hayer! Solidarity with the anti-fascist protesters in Charlottesville! Drop any charges against them immediately! The Charlottesville events are the latest in a series of deadly fascist and racist provocations and attacks that have escalated since Donald Trump’s election. This has included the murder of African American student Richard Collins by an alt-right fascist at the University of Maryland on May 20, which has been rightly called a lynching; the murder of two men and near-murder of a third by a Nazi in Portland, Oregon, on May 26; fascist/racist rallies in Portland on June 4 and New York City on June 10; the bombing of a mosque in Bloomington, Minnesota on August 5; and many others. The weekend prior to the August 11-12 fascist rally in Charlottesville the “Patriot Prayer” fascist outfit viciously beat counterprotesters in Portland. It is urgently necessary to mobilize labor/black/immigrant power, in alliance with all those targeted by racist and fascist terror, to smash the fascist provocations. Crucial to this is the disciplined, organized preparation of workers defense guards based on the power of the labor movement and the multiracial working class that makes everything run and can bring everything to a stop in this country. Portland, Oregon labor militants pointed the way with the June 4 Portland Labor Against the Fascists mobilization, which brought out several hundred workers, including members of 14 unions, against the fascist/racist provocation there. Alt-right forces are reportedly targeting New York, Los Angeles, Seattle and several other cities for provocations this coming weekend. Union stalwarts who spent weeks on the Verizon strike picket lines two years ago have expressed burning anger against Nazis’ threats to bring their race-terror to NYC. Currently, the strike of 1,800 Spectrum workers is in its fifth month, solidarity actions with the immigrant workers fighting union-busting at B&H Photo continue, and TWU transit workers (along with just about everyone who works in the city), are living through the “summer from hell.” The potential for mass mobilization bringing out the power of the workers and oppressed is right here. But to do that, this power must be unchained from its subjugation to the bosses’ politicians and parties. Who paved the way for Trump? The Democrats, with Obama beefing up the I.C.E. immigration police and deporting well over five million immigrants, Wall Street warmonger Clinton vowing more of the same and Bernie Sanders rounding up votes for Hillary. Around the country, Democratic mayors are the bosses of the armed fist of the biggest and most powerful force of racist terror, the American capitalist state. The drumbeat of racist police terror continues unabated, as more names are added each week to those of Philando Castile, Freddie Gray, Michael Brown, Sandra Bland, and so many others. While KKK and Nazi terrorists parade with assault rifles and automatic pistols, liberals preach gun control, which would disarm black people. Gun-control laws took off in the late 1960s to stop the Black Panthers and empower the racist police. We defend the right of black self-defense, particularly in the face of the escalation of lynch-murders. Meanwhile, the Democrats’ recipe for “resisting” Trump is to whip up hysteria over a “Russian menace” while calling for attacks on Syria. And don’t forget it was Obama who counseled Trump to go after North Korea. 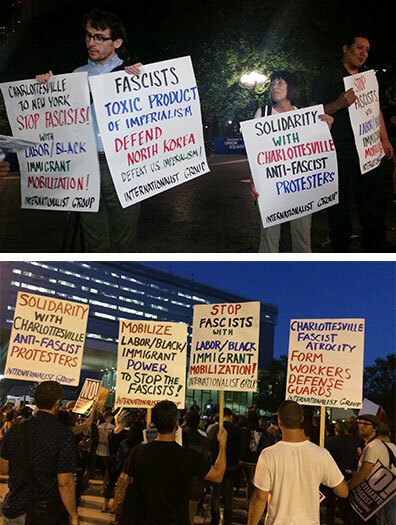 Internationalist Group in New York City (above) and Los Angeles (below) on the evening of August 12 at protests denouncing fascist murder earlier in the day in Charlottesville, Virginia. Now the Democrats – with the neo-Confederate attorney general Jeff Sessions and other Republicans getting in on the show – have pressured Trump to be “more forceful” in ritually criticizing alt-right and fascist groups. So now the immigrant-bashing president reads out some rote phrases like “racism is evil” and denounces “hate” – while continuing to stoke racist terror with every move, first and foremost threatening to rain “fire and fury” on North Korea. The Internationalist Group calls to defend North Korea against U.S. imperialism! As IG signs have stated in protests over the past days, “Fascists: Toxic Product of Imperialism.” Bolshevik revolutionary Leon Trotsky emphasized that to fight fascism, it is necessary to fight imperialism, which can only be overthrown through international socialist revolution. Liberals and reformists who look to Democratic politicians – whether Virginia governor McAuliffe, Charlottesville mayor Michael Signer, or NYC mayor Bill de Blasio on up to Bernie Sanders et al. – put forward a strategy for defeat. McAuliffe and Signer are the bosses of the cops in Charlottesville who pepper-sprayed anti-fascist protesters as the Nazis carried out their terror, while de Blasio is the boss of the cops who murdered Eric Garner, Akai Gurley and others. Every historical struggle against fascism underlines that to defeat this deadly menace, we must mobilize our own class power independent of all wings of the capitalist rulers.